Elevate your senses! Take a Golden Bay Air scenic flight from Takaka, Motueka or Nelson Airport. From the golden beaches of the Abel Tasman and the mighty peaks of Kahurangi to the extraordinary landscapes of the Wharariki sea arches and Farewell Spit, you are spoiled for choice. Every passenger is seated in a comfortable window seat offering outstanding photo opportunities. Our two-way headsets allow you to listen to the pilot's informative commentary and talk to fellow passengers and the pilot. We offer on-demand flights (with a minimum of 2 fares) from Takaka, Motueka or Nelson. Choose your own stunning aerial tourplease phone or email to book an on-demand flight or custom quote a route of your own design. Experience the thrill of flying with this short hop over Takaka township, Pohara Beach, Port Tarakohe and the old cement works. Witness how the lush Takaka Valley is protected by the rapidly rising ranges of Abel Tasman and Kahurangi National Parks. Abel Tasman is gorgeous from the air. Fly over golden sand beaches and tidal estuaries fringed by native forest and azure waters. Spot granite outcrops, cascading waterfalls and secluded huts. Return via Takaka Hill and glimpse the depths of Harwoods Hole. Follow the Bay's sheltered shoreline around to the exposed coastal landscape at the base of Farewell Spit. Then trace the dunes and lakes up the Spit to the refuge of its lighthouse. Return via the northern bays of Abel Tasman. Fly up the Antoki Valley and over New Zealand's highest hydo lakethe Cobbwith spectacular views to Mt Arthur. Witness valleys carved by ancient glaciers, remote goldmining dams and spectacular mountain scenery including the aptly named 'Dragons Teeth'. Fly the Bay's sheltered shoreline across to the famous sea arches at Wharariki Beach. Trace the dunes and lakes the length of Farewell Spit to the lighthouse before heading to the golden sand beaches and vivid waters of Abel Tasman coastline. Return via Takaka Hill —the "marble mountain"—with a glipse down Harwoods Hole. For the ultimate flight experience, add all four incredible flights together—towering Kahurangi Peaks, wild West Coast, the shifting sand dunes of Farewell Spit and golden Abel Tasman beaches. 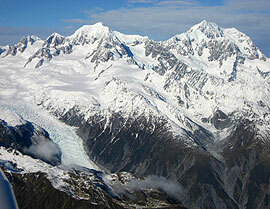 This flight has the most variety of any scenic flight in New Zealand! Depart the organised pattern of orchards and vinyards surrounding Motueka to cross the Marble Mountain Takaka Hill. Passing over the Canaan Downs, (a Lord of the Rings filming location) take a glimpse down the dark depths of Harwoods Hole. Return via Abel Tasman's forest-fringed golden sand beaches and azure waters. Climb up to the marble karst landscape of Mount Arthur to view New Zealand's highest hydo lakethe Cobb Reservoir. Witness valleys carved by ancient glaciers, remote goldmining dams and spectacular mountain scenery including the aptly named Dragons Teeth. Return via inviting beaches and bays of the Abel Tasman. Even those short on time can capture the unique formation that is Farewell Spit. Fly over Takaka Hill and Golden Bay to the Wharariki sea arches, then trace the dunes and lakes up the Spit to the refuge of its lighthouse. Return via the sheltered coves of the Abel Tasman. A circuit of the flooded valleys, islands and peninsulas that make up the Marborough Sounds—includes D’Urville Island and the outer Sounds, Mount Stokes, Pelorous, Keneperu and Queen Charlotte Sounds, returning via Picton and Havelock with views over Cook Strait to the North Island. Explore some of the most interesting sections of Kahurangi National Park including Mount Owen (LOTR location), up Lake Rotoroa to Lakes Constance and Blue Lake (clearest water in the world) and fly amongst the highest peaks in the Park. Return via Lake Rotoiti and the curiously barren Red Hills on the Richmond Range. For the ultimate experience, why not sample all our Golden Bay routes? Fly over jagged mountains in Kahurangi to the sheer limestone cliffs and tumbling ocean on the West Coast. Then trace the dunes and lakes of Farewell Spit and return via the golden beaches of Abel Tasman. Leave the city behind and cross the orchards and vinyards surrounding Motueka to cross the Marble MountainTakaka Hill. Passing over the Canaan Downs, (a Lord of the Rings filming location) take a glimpse down the dark depths of Harwoods Hole. Return via Abel Tasman's forest-fringed golden sand beaches and azure waters. Climb up to the marble karst landscape of Mount Arthur to view New Zealand's highest hydo lakethe Cobb Reservoir. Witness valleys carved by ancient glaciers, remote goldmining dams and spectacular mountain scenery including the aptly named 'Dragons Teeth'. Return via the Takaka Valley and Harwoods Hole. Pass by Nelson port and boulder bank to view the tidal surges at French Pass, seperating D'Urville Island with the mainland. Witness the bewildering network of flooded valleys that make up the Marlborough Sounds before returning via Picton and Havelock. Please phone or email to book your scenic flight.